The APAO Congress in 2003 was still in the era when APAO Congresses were held once every two years. It was the most successful APAO Congress ever then with more than 1,200 delegates, more than 300 submitted abstracts and more than 40 exhibitors. It was, however, surpassed very quickly by the following APAO Congresses. Fifteen years later, the latest APAO Congress in Hong Kong had more than 5,000 delegates, more than 1,500 submitted abstracts and more than 250 exhibitors. APAO Congresses have, without a doubt, become a yearly global event in ophthalmology with huge success. 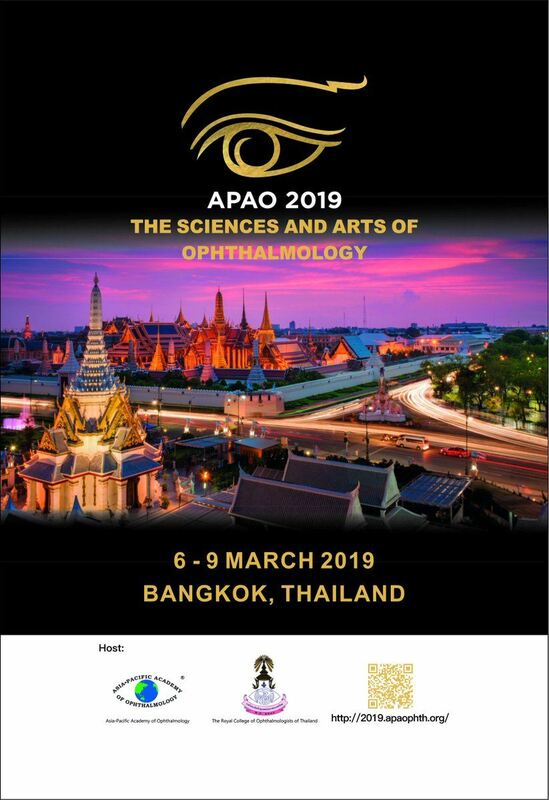 The Royal College of Ophthalmologists of Thailand is proud to be part of the growing APAO. We are honored to be given this great opportunity to host the APAO Congress one more time after more than 15 years. We welcome ophthalmologists and related personnel from all over the world to the “Sciences and Arts of Ophthalmology.” While the growing success of APAO is certainly due to the strength of the scientific programs, friendship, the social part or art of academic meetings, is also slowly built up through APAO Congresses. I believe if APAO council members, speakers and delegates who attend APAO Congresses regularly through the years count the number of new friends they know from the congresses, they will find the number is enormous, or even countless. The current President of the Royal College of Ophthalmologists of Thailand, Dr. Anuchit Poonyathalang, said in the welcome video for APAO 2019: “When our Thai hospitality meets academic spirit, APAO 2019 will bring the best of sciences and arts that ophthalmology offers.” He is certainly correct.